After 12 very slow weeks, I was finally going to get this torture device removed! This was the day I’d been looking forward to for almost 3 months, and finally it was here! I was due to be seen by Mr Heidari on Thursday 2nd of March 2017, and as I was his first patient of the day I needed to be at the hospital early. I’m not usually a morning person, but this time I really didn’t mind the alarm going off when it was still dark! 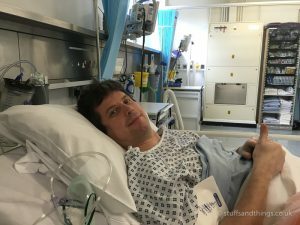 As this is a short procedure, Mr Heidari was happy to do this at the London Independent hospital which is just up the road from where I live. This saved me the longer taxi ride to and from the Princess Grace hospital. 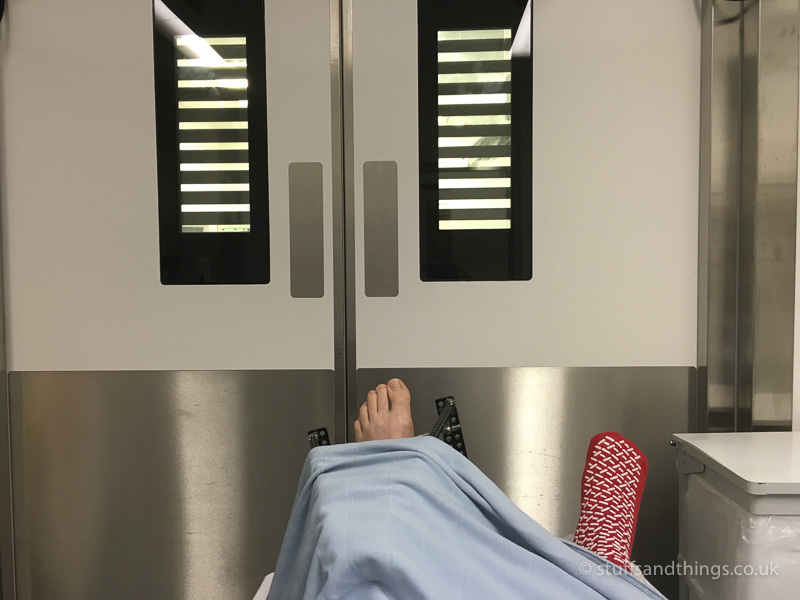 I arrived at the hospital at around 6.30am, and was checked into my room and changed into my gown by 7am, and then wheeled down to the operating theatre at 8am in a wheel chair. Just before I was injected with the anaesthetic, I took one final photo of my leg with the frame fitted then handed my phone over to the anaesthetist. 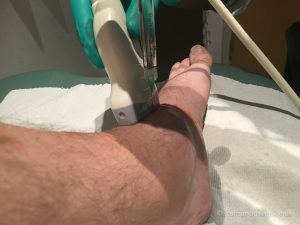 I had asked if he would be able to take some video of the procedure, which he was happy to do – you can see the results below! As it was such a quick procedure to remove the frame, I was awake in the recovery room just 1 hour later. Not long after that, I was taken back to my room to rest and wait until I could be discharged that evening. It was an amazing feeling to finally be free of the frame, and I couldn’t wait to get home and start the final stage of my recovery. Ready to head home and get a hair cut! I rested in my room for the rest of the day, and after a while the physio popped in to get me fitted with an air cast boot which I would need to wear for the next 2 weeks. Finally, at around 6pm I was discharged and on my way back home. 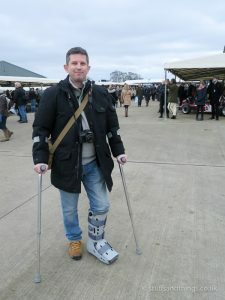 Even with the boot, it was still too painful to fully weight bear, so I still needed to use both crutches. 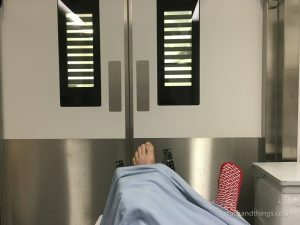 Pain-wise, things weren’t too bad – the most painful areas were where the 3 screws went into my leg bone, as these were open wounds and rather tender. Note: The timelines below are from when the frame was removed (2nd March 2017). One benefit to not having the frame fitted was that I could finally sleep properly! I find it difficult to sleep on my back usually, and much prefer to sleep on my side – which was very difficult with the frame fitted. A couple of days after the operation, I was back at the London Independent Hospital to have my dressings changed. This was the first time I’d see my ankle without a frame fitted in 3 months! It hadn’t really been cleaned during the procedure, so looked a bit worse for wear, however the nurse was happy with how it appeared. One of the first things I wanted to do was get my hair cut! 3 months without a trim had me looking rather unkempt, and I was really glad to finally be able to make it to the hairdressers! Next stop was a fry up at the cafe next door – this may seem like a little thing, but having been stuck at home for 3 months this was a real treat! I tried to take things easy, as my ankle was quite sore and would swell up very quickly. I could get around at home without the boot, however needed to wear it whenever I went outside. 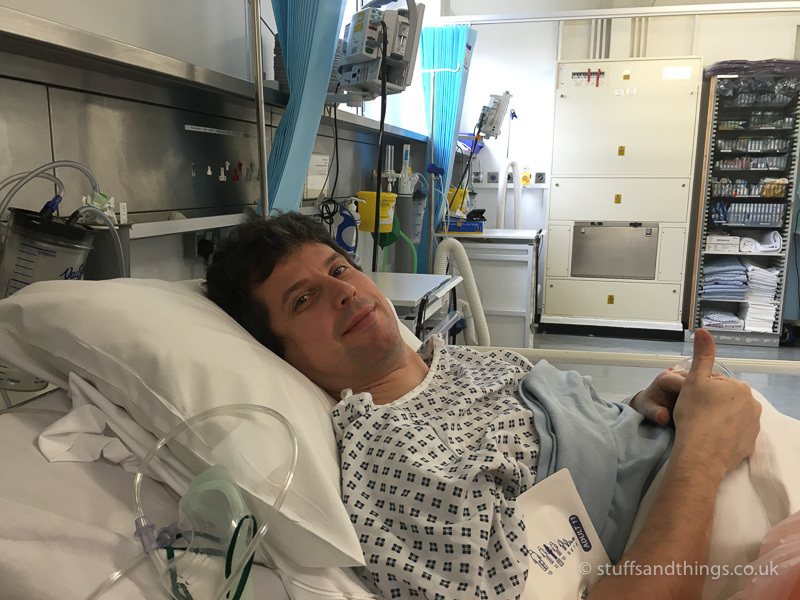 A few days after the operation, I was due to go to the Apollo in Hammersmith to watch Elbow with my girlfriend. I was quite worried about how my ankle would fare, so it was with some trepidation that I travelled over there in an Uber cab. I had done my best to avoid stairs during the previous 3 months, so I was quite nervous of the fact I’d have to go up a couple of flights (and back down) to get to our seats. They weren’t as bad as I feared though, and I just took it steady. I was really touched though when one of the staff at the Apollo saw my plight, and offered us different seats with more leg room. I’d continued working from home during the first week after having the frame removed, but finally ventured in on March 10th. As expected, my ankle became very swollen, which was quite uncomfortable being stuck in the air cast boot. I just had to wait until I got home though, where I could lie down and raise my leg into the air to get some relief. 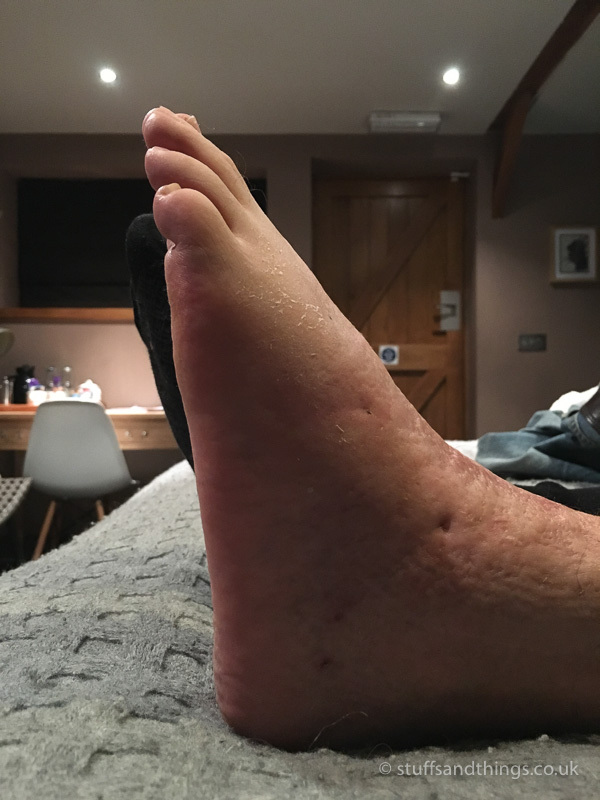 It’s quite strange looking at my ankle when it swells up, as the pin sites and wound areas don’t swell, so you get these big dimples. I did achieve something that week though, and managed my first few steps without the boot and with just one crutch! This was quite an achievement as it meant I could get to and from my kitchen carrying things in one hand, rather than having to nudge everything along on a trolley with a crutch. Just over 2 weeks after having the frame removed, I went to Goodwood for the Members’ Meeting motor racing event. I finally managed to get back behind the wheel of my car (an automatic fortunately), and could just about drive it wearing the air cast boot. The team at Goodwood were very understanding, and allowed me to park in the disabled car park, which meant I could get a lift to the main gate. This really helped, and meant I could use all my energy for walking around inside the circuit. 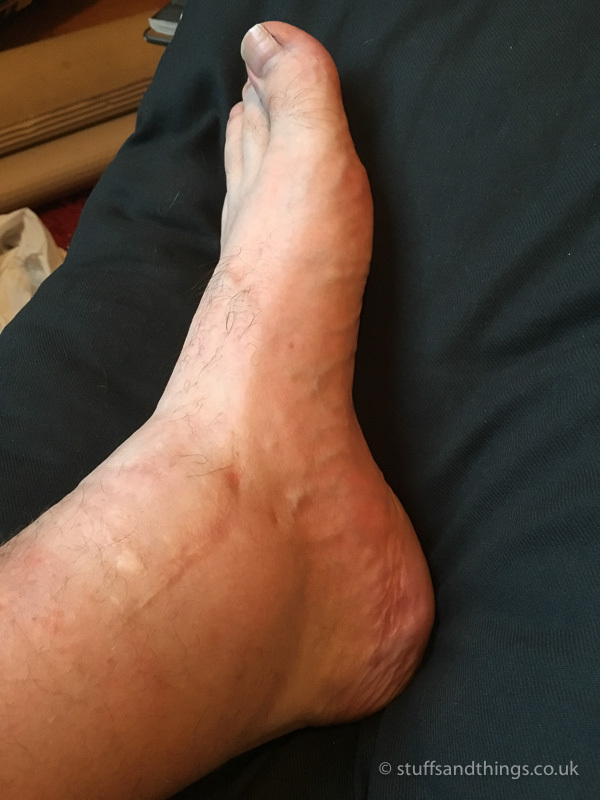 My ankle wasn’t too sore, but I could feel it swelling up, and I managed to walk a couple of miles a day which I thought was quite a good effort. After that weekend, I got rid of the boot, although still had to use one crutch to get around. I think the exercise that weekend helped though, as the day after I got back, I managed to walk a short distance without the boot or crutches, which I wasn’t able to do just a few days before. Back at the B&B, it was a relief to lie down, and take the boot off. It was strange to see my ankle, as it had swollen up to take on the shape of the boot. 4 weeks after having the frame removed, I went skiing! Sadly, this wasn’t some sort of medical miracle, but I was there purely as a spectator along with a group of friends. 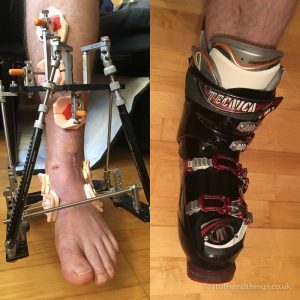 I’d been telling myself all through the 3 months with the frame that I would be fit enough to do a little bit of skiing, however the closer I got to the trip the more I realised how impossible that would be. I still needed a crutch to get around, and my ankle was just too stiff and painful to even contemplate getting it into a ski boot. And having gone through all the pain and hassle to get this far, I really didn’t want to risk damaging it and undoing all that work. It was nice to be on holiday, and of course great to be able to enjoy some apres ski, however I did struggle a bit walking around town. The steep hills meant I had to bend my ankle more than it was used to, and also walking with a crutch is quite hard work on flat ground – let alone up hills. Half-way though the second month, I made it to the gym for the first time to do some gentle exercise. I did 15 minutes on the exercise bike, however managed to bash my heel against the pedal crank which was really painful! Bizarrely, my foot was pointing out by several degrees which meant the heel was very close to the inside of the bike and of course the inevitable happened. A couple of days after this, I reached another important milestone, and made it up to my own bed for the first time since the start of December! You may ask why I couldn’t get up there before, and the answer is because it’s up on a raised area in my flat, and you reach it via a vertical ladder. I was on a roll now, and the following day I managed to potter around at home a bit without using any crutches, however my ankle reacted quite badly to this and was very sore and stiff in the evening. At this stage, I was having regular physio, and around 7 weeks after the op to remove the frame, my dorsiflexion was measured at 19 degrees. I was also trying to get to the gym more regularly, and found it quite hard work even doing light exercises – it’s amazing how unfit you become after hardly doing anything for 3 months! Exactly 2 months after having the frame removed, I managed to get out and about properly without any crutches! This meant I’d been on crutches for 2 months after the Ilizarov frame was removed, so 5 months in total. It was only a short walk – about 400 metres to my local gym – but was a great feeling to know I could do it. The ankle was still painful at this point – especially if I sat down for any length of time. It would stiffen up, and take a while to get going again. I’m sure people at work thought I was faking it when I’d get up from my desk and start walking with a big limp, then appear fine 5 minutes later when I strolled back to my desk! At this point, it was a case of persevering with the regular physio sessions, trying to get to the gym and building up strength. I also wanted to lose some weight, as the more weight you carry, the more stress on the joint. According to my physio’s notes, my dorsiflexion was now a couple of degrees better than it was 18 months previously. This surprised me as it didn’t feel any better – which I think was down to the fact that it took a lot of effort to bend my ankle that far. He gave me some exercises to do in order to improve the amount I could bend my knee forward, however this seemed to agitate the joint so I didn’t continue with these. 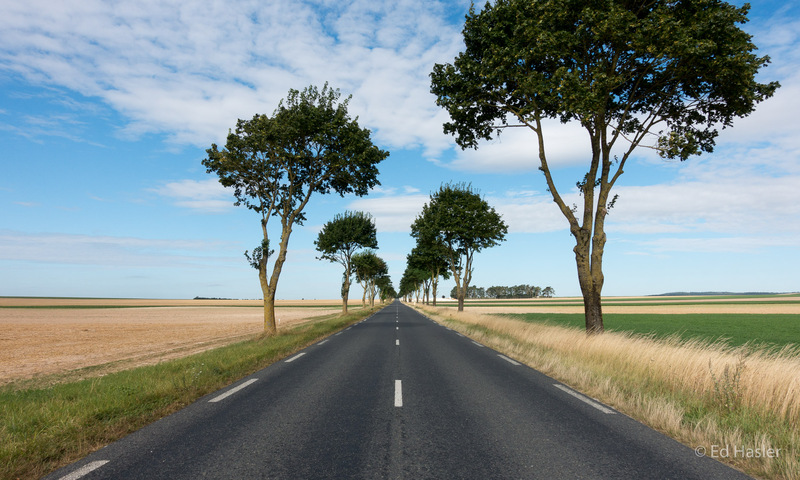 During this recovery period, I usually had some sort of pain somewhere – it would often move around my ankle though. The pin sites around my heel could be quite painful at times, and the sharp pinching pain within the joint was still there. As the year progressed, I became more active as my ankle improved and I wasn’t so restricted by pain. I had to be quite careful though, as I was still quite limited in how far I could walk before it would become stiff and painful. I also found that wearing an ankle support stocking helped. It would support my ankle, and also help keep swelling down. I tried a few different styles, and this one ended up being my favourite as it gave a good amount of support, but didn’t have thick seams which dug in to my skin and caused pain. I still suffered from a lot of pain when starting to walk after sitting down for any length of time. 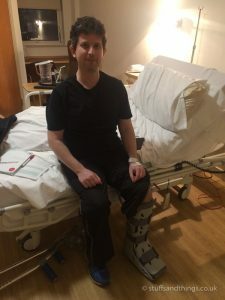 At times, it was agonising, and almost unbearable to walk on – however if I pushed through the pain it would start to improve after a few minutes. Overall, I was quite disappointed at how bad my ankle felt, and was expecting it to have been in much better shape at this point. However my physio said my rate of improvement was what he expected, and that it usually takes 6 months after removal to get to the point you were before it was fitted – then another 6 months of improvement after then. So I should continue to improve until March 2018. Occasionally though I pushed on through the pain if I had to, and in June I managed to walk 6 miles in a day when I was at the 24 hour motor race at Le Mans, then built that up to 8 miles by the end of August when I was on holiday. This would inevitably result in it being very swollen and painful that night, and the following day too. Around July, I noticed something new – a sharp pain on the left hand side of the joint – as if a tendon is catching the bone. It was enough to stop me in my tracks when walking, and really felt like something would tear. I found that giving it a quick rub sorted it out, and fortunately this only lasted a month or so. Mid-October (just over 7 months after the frame was removed), I had a follow-up appointment with Mr Heidari. I explained that I was still suffering a lot of pain, and some swelling on the right/front of the joint so he referred me for an MRI scan. Once the results were back, I saw him again and he talked me through what he could see. Unfortunately, the scan showed that I have virtually no cartilage at the front of the joint, and there is also a cyst on the bone and localised swelling around this. So based on that, the operation didn’t achieve anything. My ankle has also started to click and clunk as I walk, which while not particularly painful is quite an odd and unpleasant sensation. Towards the end of October, I had a Durolane injection into my ankle joint to try and help with the pain at the front right of the joint. My Heidari had suggested I try this, as some trials suggested it was more effective than Ostinol which was the other fluid I had been injected with previously. The ultrasound-guided injection itself was similar to others I’ve had in the joint- not the most enjoyable experience, but it was over pretty quickly. Unfortunately though, within a few minutes my ankle was becoming very sore and stiff. It was so painful I could barely put any weight on it, and I had to hop out of the hospital and into an Uber. For the next few days, the pain was agonising and I had no option but to go back to using a crutch and hobbling around. It took about 5 days for everything to settle enough for me to get rid of the crutch again. Although the pain finally disappeared a week or two after after the injection, I didn’t notice any benefit at all. 12 months on from the initial operation to fit the frame, and I think I’m still worse off than before – although it’s pretty close. Most of the time I can walk around without too much discomfort, however if I do too much it still swells up and becomes very painful. Standing around for periods of time seems to be worse than moving – I guess the movement keeps the fluid from building up. 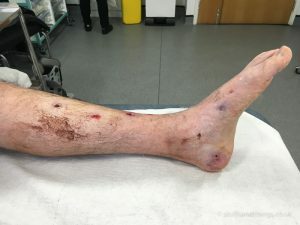 Day to day, I can do most things – walking to the shops, commuting to work etc… I just can’t run – that quick 20 metre dash to catch the bus that has just pulled up is out of the question now, as even that will cause my ankle to flare up and hurt for the rest of the day. On a good day, it doesn’t hurt – but it just feels a bit stiff, reminding me not to push it. Thankfully, these days outweigh the bad. 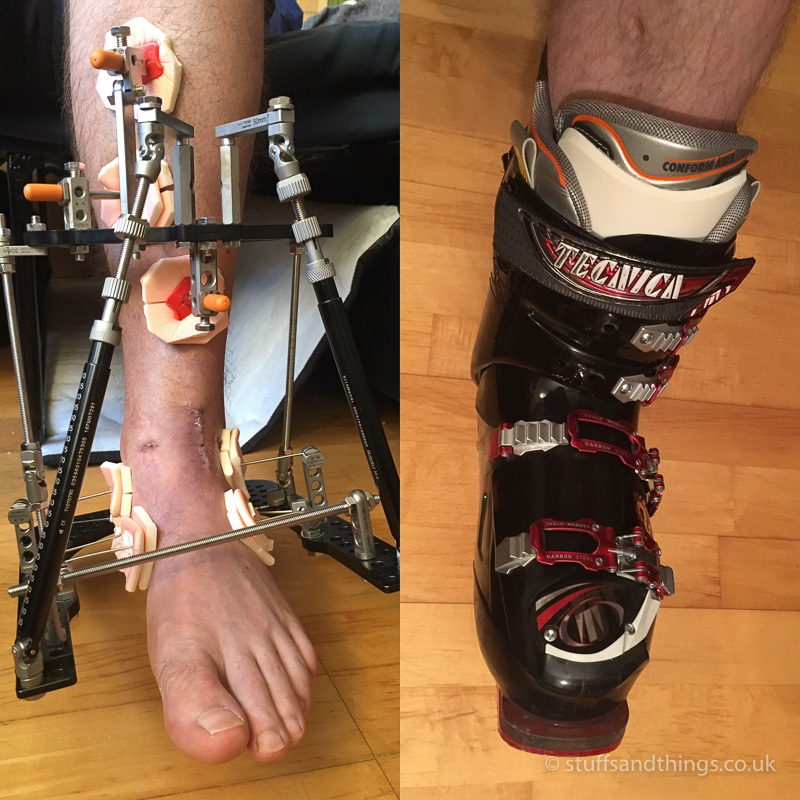 Towards the end of the year, I decided to try on my ski boot, to see if I could realistically contemplate a ski trip this winter. I’m not expecting to be racing down black runs, but if I could get back on the slopes and enjoy some gentle blues then I’d be happy. I just about got the boot on, and it felt OK – although not 100% comfortable. However I think it will be just about OK to give skiing a go in a couple of months! Come back soon to find out how things have progressed. Sorry to hear that your op doesn’t appear to have been successful. 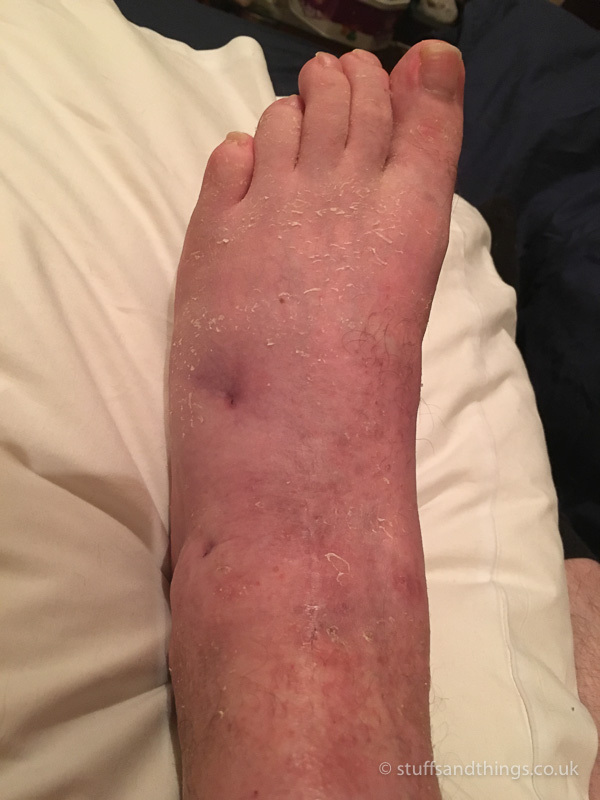 As someone who has had one failed ankle fusion I can understand your utter frustration. The answer to my problem was a change of consultant. I spent 18 years with one consultant who went through all the procedures for an arthritic ankle and made it worse every time, only to be onward referred after 18 years to another consultant who is a frame specialist at Salford Royal. I am now walking better than I did 20 years ago. Best of luck with your treatment, keep practicing that Strat! Hello – I am meant to be having the operation in September and wondered how you are now ? Sorry for late reply – I missed your message in the middle of a load of spam comments. Things have been improving very slowly this year, and generally it has been OK unless I push it too much (i.e., walking for more than 4-5 miles in a day, or carrying heavy stuff). I don’t think it is better than before the op, but it’s hard to know if it has had any longer term benefit.